Is the wire supposed to buckle like this? Though it was not officially on the itinerary of our trip to Costa Rica last month, not long after we arrived my son Brandon got himself a hankering to go zip lining. Now I'm someone who throughout his life has steadfastly avoided upward mobility for fear of heights. So I offered protest. "Let me get this straight, Dad," said Brandon. "You're afraid to be gliding hundreds of feet above the forest suspended on a thin wire?" "No, not exactly. 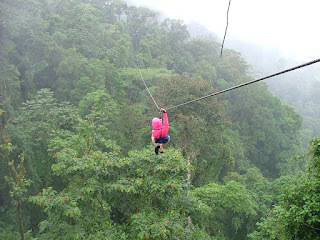 I'm afraid to not be gliding hundreds of feet above the forest suspended on a thin wire when I'm supposed to be! 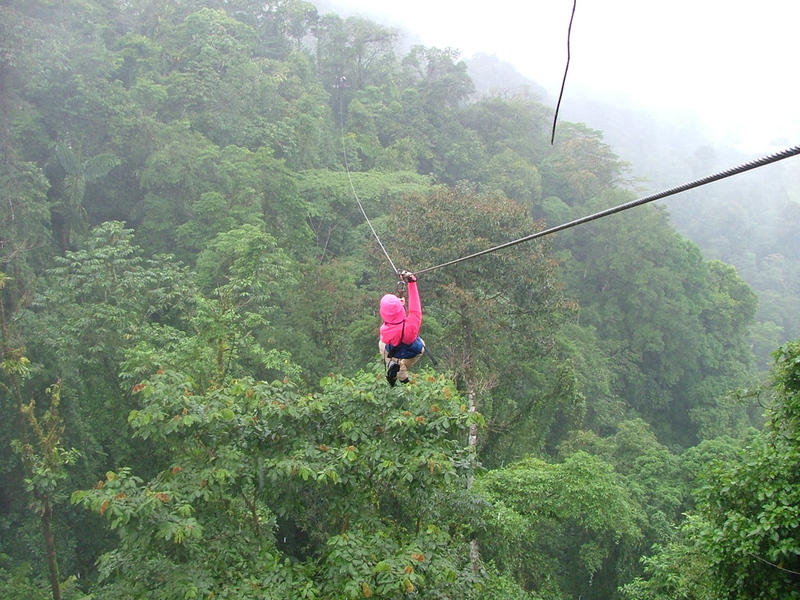 "Dad, every day people zip line all throughout Costa Rica without incident," said Brandon. "Then an incident is long overdue!" I pointed out to Brandon that there are no safety regulations whatsoever in Costa Rica for zip lining. I reminded him that an unfortunate accident could put a crimp in our dining plans. I mentioned once more that I'm the kind of person whose fear of heights is so severe I have regular nightmares about actor Brad Garrett hoisting me on his shoulders. I stood up like a man about being scared like a baby! And 45 minutes later we were at the entrance of Casa del Zip, clearly marked from the street by a large colorful billboard poster of a man with exultant expression soaring high above the rain forest. "No way that guy is Jewish," I said to myself. We were greeted inside by Alejandro, a friendly enough type who assured me that safety was paramount at Casa del Zip and that I'd be decked out in the latest and most modern zip lining equipment, which apparently these days is manufactured with holes in one of the gloves and rust spots on the harness strapped around you. It's counter intuitive, for sure, but Alejandro seemed to know his stuff. "I'm a little apprehensive about all this, Alejandro," I said. "I have fear of heights." "Oh, you'll be fine. Trust me!" Totally reassured by a complete stranger telling me to "trust him," I climbed with Brandon and Alejandro into the cable car that would take us to the summit where our zip lining adventure would begin. "OMG!" I screamed. "I knew it! I can't go this high! We've got to turn back!!!" "We're not out of the building yet." We gradually ascended to a height from which I could see my house in Pennsylvania, then climbed about 800 half rickety steps to the rickety final platform. At the top was a small bar area with a young women selling drinks. "You may want to have shot, Mr. Block," said Alejandro. "A shot? No, I want a bottle of your finest ...."
Brandon went first, smile on his face like the crazed guy on the poster. The zip lining apparatus made a whirring sound as if a clothes line were unreeling and across he went, caught at the end by another member of the Casa del Zip zip lining crew apparently in one piece and still eligible to be in my will. "Call out that you are ready, Mr. Block," said Alejandro. "Ready? I could only ever be ready if I were structured differently genetically and had had an alternative upbringing." "Kind of R-e-e-a-a-a-d-d-d-e-e-e!!! " I called out. My feet left the platform and I heard that godawful whirring sound. My eyes were shut so tightly they couldn't have been pried open by the most experienced of safe crackers, and I felt my body dangling, which is one verb I never like using in conjunction with any bodily part of mine, let alone the whole body. Then I forced my eyes open and saw myself sliding along a thin metal wire gripping a metal hand contraption which wobbled like the top in the movie Inception. "God, I'm sorry for everything!!! I will atone my sins! I will find purpose in life! That's totally it for me with sleeping late!!!" And then I was across the chasm and caught by the zip lining guy. And still eligible to be in no one's will. And after about an hour and a half we were done all the 9 or 10 individual runs that make up the zip lining experience at Casa del Zip. Brandon had a super time. He wanted to go again. "That ain't gonna happen," I said to him. I gave Alejandro a very handsome tip. He wanted us to go again. But a strange thing did happen. Though I remained scared throughout, I managed to keep my eyes open a little longer on each successive run. I did begin to appreciate the beauty of the rain forest below, the majestic mountains nearby, and my little house in Havertown PA, although it does need a new roof. 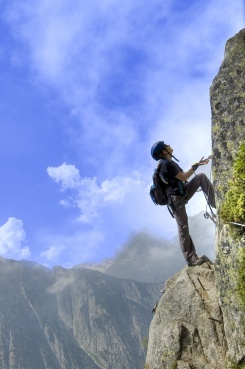 Maybe I'm now on my way to what is said to be the secret to getting over your fears and truly living your life: Doing one thing a day that scares you. This was my one thing on that one day --- August 23, 2012. I'll let you know on what day my next scary thing is scheduled soon as I figure out the best day in 2014 to schedule it for. If you had known Brandon would want to do this, you could have saved money on a briss. Just sayin'. I want to go zip lining too, but we'll have to settle for doing it in the Rockies. Sounds like a lot of fun! Scary things for me include doing or saying things I know will make someone angry or upset. I usually try to avoid that kind of thing at all costs. I don't want to start practicing it, either, so, lol, no thanks. I knew Brandon would want to do stuff like this almost from birth. He climbed out of the crib at a remarkably early age; I'd still be in it if they'd let me. One thing we did save on was the extra "s" in "bris." But you're learning. I'm sure zip lining in the Rockies is fun, and it is comforting to know that there are probably some legislated safety regulations in effect there, even if they mostly concern not going zip lining with me. Saying things that will make someone angry or upset is high on my list of scary things as well. I'm still working up the courage to tell off that annoying guy that sat next to me at work in 1983, and once I dump my high school girlfriend, just watch me fly! Yeah, it's a big problem. Maybe we ought to work on it together! Briss has two esses until AFTER they take a bit off the end. That would mean it starts with three esses?